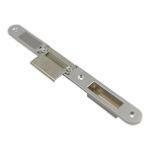 We offer an extensive selection of individual component parts for our Winkhaus Multi-Point locking Systems which can be purchased as replacements or spare parts or as part of a full lock set. In this section you will find standard & alternative flush centre strikeplates & keeps for timber & composite doors plus top & bottom shootbolts & extension parts. The Thunderbolt Multi-Point Twin Deadbolt Lock System from Winkhaus unites high security with extremely easy installation & has been especially designed with increased tolerances for door installers. 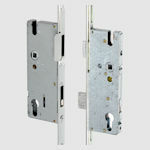 Locks are available in standard or short variants to accommodate a range of door heights & with either lever-lever or cylinder only operation. The 'Heritage' version has the gearbox unit positioned at traditional "slam lock" height & is an ideal choice for period door designs. Thunderbolt Multi-Point Locks have been tested in all door framing materials to PAS24 Enhanced Security Standards & are approved by the Police " Secured by Design" security initiative. The AV2 Automatic Hookbolt Multi-Point Lock System from Winkhaus is designed for applications where 'slam locking' is required. As soon as the door is closed, automatic locking takes place with 2 high tensile steel hooks engaging without the need to lift a handle. 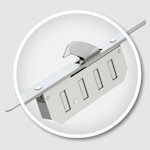 AV2 locks are available in short, standard or tall variants to accommodate a range of door heights plus a 'Heritage' version which has the gearbox unit positioned at traditional rim latch height. AV2 Multi-Point Locks have been tested in all door framing materials to PAS24 Enhanced Security Standards & are approved by the Police " Secured by Design" security initiative. 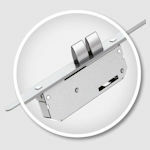 The Winkhaus Stable Door Lock is a two part lock system for timber & composite stable doors utilising the same features & performance characteristics of the popular Cobra multi-point lock system. The stable door lock features an upper section lock with lift-lever locking operation & a lower section lock with key turn activation. Cobra multi-point locks have been tested in all door framing materials to PAS24 Enhanced Security Standards and are approved by the Police " Secured by Design" security initiative. 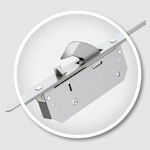 The Winkhaus FGTE twin handle solution for double doors offers the addition of a slave door lock with shootbolts that locate into keeps at the head & cill. Additional vertical shoot bolts can be added to the master door using the Cobra FGTE Master lock or Thunderbolt FGTE Master lock. Winkhaus Multi-Point Locks have been tested in all door framing materials to PAS24 Enhanced Security Standards & are approved by the Police " Secured by Design" security initiative.